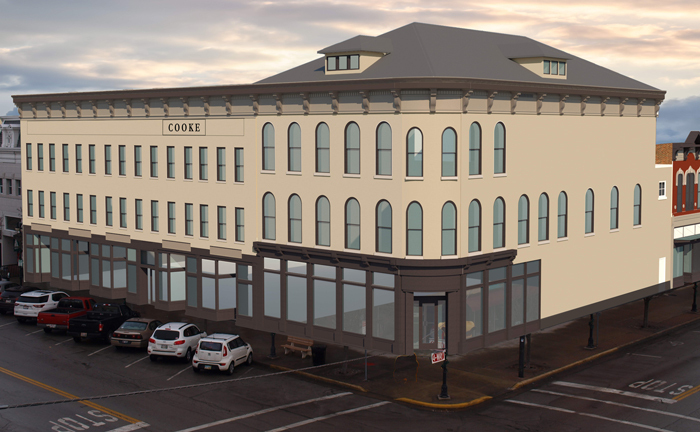 The Cooke Building, a structure built in 1850 in the heart of downtown Sandusky located on the corner of Columbus Avenue and Marketplace Street, is undergoing a $7.5 million renovation to revitalize the 47,000 square foot building. According to the developers, Meghan and Rick Hogrefe and their team at H2 Property Holdings LLC, the property will feature a range of commercial spaces with different sized spaces on each level. According to the Hogrefes, the project will take 12-14 months to complete, with construction on the building starting in early March. Regency Construction Services, Inc., based in Brook Park, Ohio is the general contractor and Jeff Foster of Cleveland-based Payto Architects is the architect for the project. The building itself was first constructed in 1850, with a second half added in 1860. According to the Hogrefes, Jay Cooke, a famous financier of the North during the Civil War and a local son, built and owned the building. It was always considered the commercial center of downtown, and many important businesses resided in the Cooke over the years, anchoring the commercial soul of the city. “When the city began to lose its industrial base in the 1980s and jobs began to disappear, downtown began to lose businesses completely, or to areas outside of town where the Cedar Point traffic offered hope for survival. Downtown became almost empty with just a few businesses remaining, mainly thrift shops. This decline continued until a few years ago when a few intrepid local investors began to open new bars and restaurants downtown, showing that a revitalization was possible, if only the money would come,” said the Hogrefes. According to the Hogrefes, the Cooke Building stayed in the family’s hands for all these years, deteriorating as the finances needed to repair the building dwindled, and the rents acquired in the crumbling building were nowhere near enough to justify restoration. The City of Sandusky was involved in several failed attempts to get developers interested in saving the building and was about to abandon hope when it was purchased by H2 Property Holdings with the view to completely restore the entire edifice to its former glory. The Hogrefes view this as a legacy project and more a gift to the city than a business decision based on return. “The building was deteriorating rapidly and the City was not able to find anyone willing to take on the restoration project and was looking at demolishing the Cooke. This was not acceptable to me. Our objective in downtown Sandusky is really to renovate the city itself. We believe that pride in our city’s heart – downtown – is one way to begin the process. The Cooke Building is central to downtown Sandusky and is one of the oldest standing buildings with a rich history. We felt that it coming down would be perhaps the final straw for Sandusky, initiating a fast slide into a ruined downtown. It had to be saved. We felt the Belle of Sandusky needed to regain her crown,” said Rick. The Hogrefes have several other projects in downtown Sandusky, most notably the Marketplace at the Cooke next door, which will be an indoor mall and will also contain a Children’s Museum funded by the Hogrefes’ charity. Several others are already mirroring the Hogrefes’ investments already, including the new City Hall and the restoration of the Feick building by other developers. “In order to attract good business to downtown, it is critical to have good spaces. 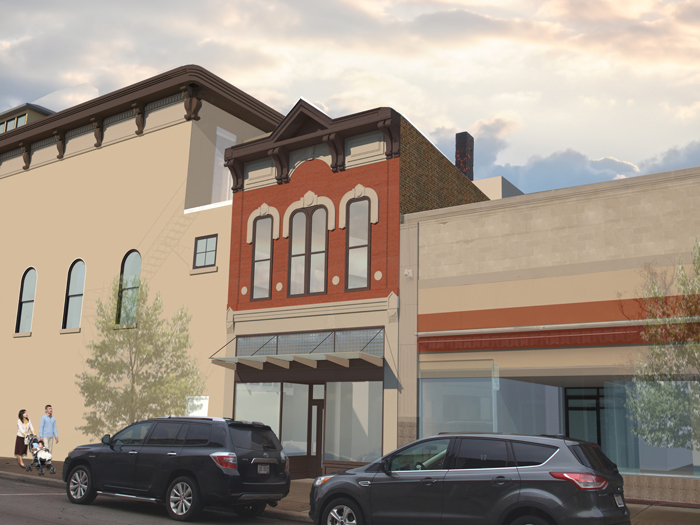 Our goal is to provide those spaces, as well as continue to save the historic downtown of Sandusky, which in itself is important to the development of Sandusky,” said the Hogrefes. According to the Hogrefes, all three floors of the building will be restored. The first floor will remain retail space, the second floor will be restored to its origins as office space, and the third floor will have a ballroom / event hall and theater and will be rented for concerts, plays, weddings, functions, reunions, and other events. “The project itself is a top to bottom renovation with an attempt to restore as much of the original building as possible. The second and third floors were badly neglected and we are bringing back the original design of the edifice the best we can. We do have to add more safety features, of course, such as more staircases and sprinkler systems, and we are adding an elevator as well. In order to make the new design work, we purchased a small building adjacent to the Cooke, which will serve as the new grand entrance and contain the main staircase going to the third floor as well as the elevator. As it turned out, this building was actually a part of the Cooke to begin with, so we merely restoring the building to how it was originally,” said Rick. The first floor will have five retail ground level spaces of about 3,600 square feet, 3,200 square feet, 1,500 square feet, 1,150 square feet, and 870 square feet. Each of these spaces could contain restaurants, stores, or offices, noted the Hogrefes. The second floor will have 9,500 square of rental office space with a total tenancy of 70 people on the floor. The third floor ballroom and theater will be restored to their former glory and will hold 130-145 people respectively. “We are already in negotiations regarding the use of the third floor for a number of different types of events, but mostly centered on music,” said the Hogrefes. Rick also noted that H2 will do its best to make the building as efficient as possible. In total, the renovation itself will total $7.5 million. The Hogrefes and H2 Property Management received a $500,000 grant from the City, which is being used to fund its Emerging Sandusky Business Grant program, and also received federal tax credits for 20% of the project, but that will be realized over the next 5-10 years most likely, noted Rick. The State of Ohio rejected the bid for State credits. Most of the funding came from Rick selling his biotech firm in San Diego. The Hogrefes looked into the potential economic impact of the building as well. In the first floor retail space, the Hogrefes estimated that an average of four employees plus one manager per 1,000 square feet is fair based on the types of business most likely to go in these spaces. There is a bit over 10,000 square feet, so they estimated 10 managers and 40 total employed staff for the first floor. On the second floor, they estimated that there will be at least 50 people employed and the tenants will have high-paying jobs. The third floor will not have tenants, but the Hogrefes noted that catering firms, music acts, local event firms, and other businesses in the entertainment industry will be impacted.